In 1966, Laurier’s Department of Political Science began with five full-time faculty and one undergraduate program with nine students; the Masters of Political Science program followed shortly after in 1970. Today, the department boasts 19 full-time faculty, three Centre for International Governance Innovation (CIGI) and Canada Research Chairs, 450 undergraduate students and 127 students enrolled in the Legal Studies Option; and a new graduate program, the Master of Applied Politics. This year also marks the inaugural year of the joint Laurier-Sussex Bachelor of Laws Degree. Alumni, students, staff, faculty and community members are invited to celebrate throughout the year with lectures, guest speakers and events. 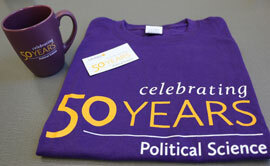 Celebrations for the Department of Political Science’s 50th anniversary will kick-off during Homecoming weekend Sept. 24. Alumni, students, faculty and staff can attend the Legends of Laurier Lecture, entitled “U.S. Election Chaos,” with Political Science Professor Barry Kay. Kay joined the department in 1978 and is an expert on American politics. Time: 11 a.m.; Reception from 11:45 a.m. - 12:30 p.m. Alumni are invited back to Laurier for a dinner with students, faculty and fellow alumni. The evening will bring together students and Laurier political science graduates who have achieved great success in exciting and interesting careers, with opportunities to share career-focused insights, experiences and advice. This event is sponsored by the Wilfrid Laurier University Alumni Association, the Faculty of Arts and the Career Centre. Space is limited. Please RSVP to Sherry Palmer at spalmer@wlu.ca or come to 4-120 to purchase a ticket. Alumni and students are invited to tour Laurier’s Brantford campus, visit the Woodland Cultural Centre and the Mohawk Institute Indian Residential School Building. We invite you to help build this fund so that we can continue to build on the experiential learning component of our program, to better prepare our students for whatever their futures hold! Make your charitable donation on line through our secure website or by contacting Harry Froklage, associate director of Development at hfroklage@wlu.ca. To commemorate this milestone, special anniversary t-shirts, mugs and magnets will be available for sale at all of our events. For more information, to purchase merchandise or to RSVP for an event, contact Sherry Palmer at spalmer@wlu.ca or 519-884-0710 x3374.